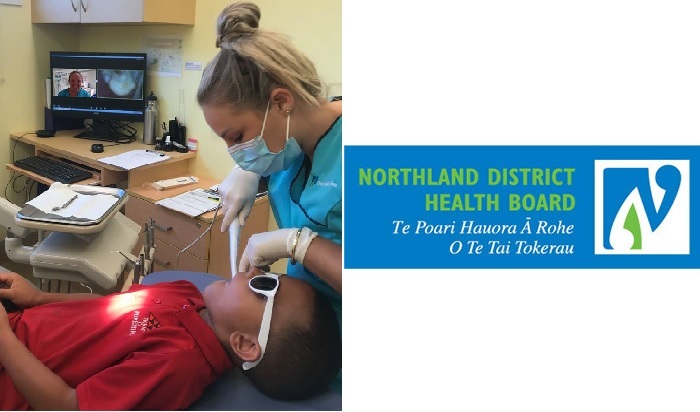 The DHB is piloting the use of Zoom video conferencing technology and a specialised intraoral camera to allow dentists at Whangarei Hospital to do examinations and consultations on children at remote locations. The first trial involved an oral health therapist operating the camera at Kaitaia District Hospital. The therapist sees the images live so is able to adjust the camera as needed and on instructions from the dentist. Previously, the dentist would have travelled to Kaitaia and seen the patients in person. Oral health therapist Kirstie Culpan says that by having teledentists, children can have their consults on time. If needed, they can also be placed on the general anaesthetic waitlist as soon as possible. Northland DHB telehealth and mobility programme manager Roy Davidson said that “the live clinical quality imaging provided by the specialised intraoral camera is the key technical component that makes these clinics possible”. He says the telehealth setup has at times proven to be a positive distraction in the clinic as children are generally interested in the technology. The service is targeting children and adolescents initially but will expand to adult services in time. A second pilot clinic was held on April 5 linking to Kerikeri and an assessment will now be undertaken and decision made on scale and timing of rolling out the service. “At this stage there appears to be strong potential to link up the oral health locations throughout Northland, including the mobile dental clinics,” said Davidson. He says the telehealth service also provides support and peer contact engagement from dentists to dental and oral health therapists who are working in the community service. “Telehealth enables assessment in real time and discussion with whānau members who are with the patient and is a collaborative tool, enabling knowledge up skilling for the clinical teams involved,” Davidson said.